Shaolin Long Fist Kung Fu is the primary style of the renown Nanjing Central Guoshu Institute. This organization is responsible for preserving the Shaolin arts after the fall of the Shaolin Temple in 1927. Shaolin Long Fist is a diverse style consisting of the best techniques of the Shaolin arts combined in a spirit of cooperation by the leading masters of the early nineteenth century. This bundle collection brings a systematic approach for learning many of the barehand sequences the way they were taught long ago. Truly and one of a kind collection by Dr. Yang, Jwing-Ming and his son Nicholas Yang. Bundle contains 4 DVDs. Learn 3 basic sequences of Shaolin Kung Fu with nearly 200 martial applications, and over an hour of DVD-only extra content including a stretching and warming up section, and the history of Shaolin Kung Fu. 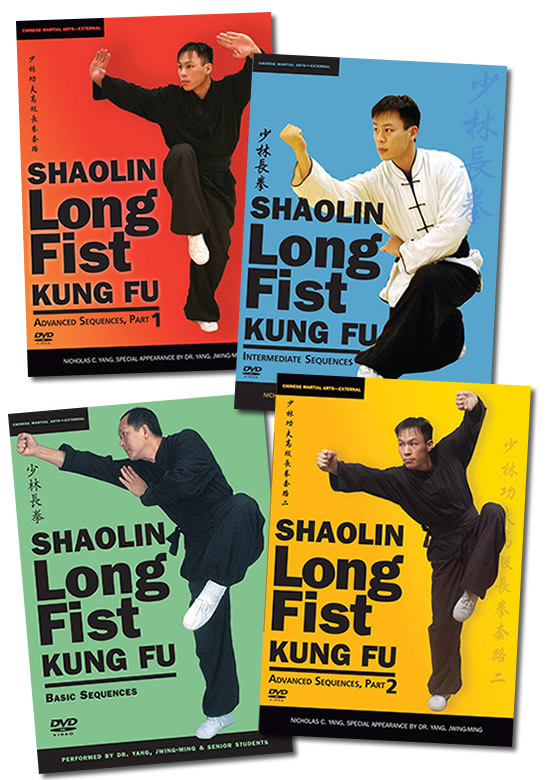 4 intermediate-level Shaolin Long Fist kung fu sequences & their martial applications. Dr. Yang discusses each sequence. 2-DVD Set. Advanced kung fu sequences San Lu Pao and Taizu Changquan build upon skills learned from intermediate training. 8 hours on 2 DVDs. Advanced kung fu sequences San Lu Cha Quan and Si Lu Ben Za build upon skills learned from intermediate training. 8 hours on 2 DVDs.